I’m sure you can probably all guess what I got up to this weekend, yup, a whole lot of Destiny. On Friday night I headed over to a friend’s house to get stuck in to the Beta for a good few hours. I had already played through most of it with a Warlock character, so decided to start again as a Titan, Ryan was a hunter. Together we made our way through the story missions, tackling them on hard just to make it a bit more challenging as when playing on my own I managed them all pretty easily. Once we were done with the story side, I was pretty desperate to try out the Strike mission “The Devil’s Lair”. 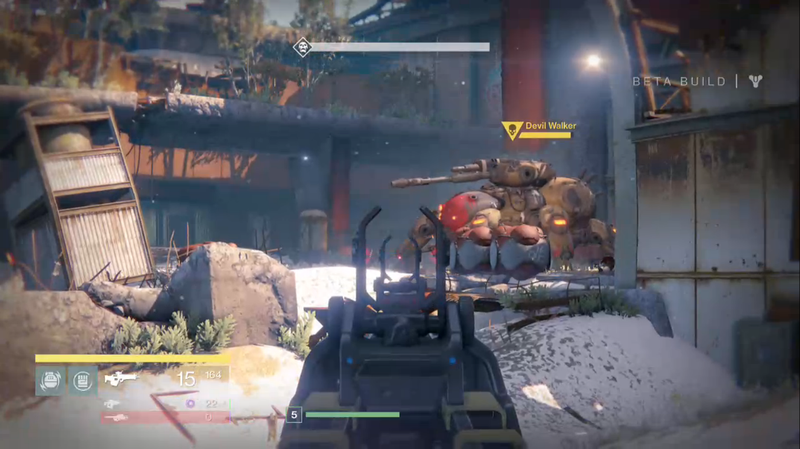 Destiny recommends that you tackle this with a fire team of 3 and to be level 6. Well we were both level 4 (almost 5), and obviously only 2 of us. We decided to try it out anyway, as this would be the only time we could both play it together. Playing through it was brilliant fun, and pretty intense. I streamed the whole thing via Twitch, so you can watch the highlights below. After we were done with the Strike mission we headed to the Crucible for a few games. We weren’t very good to start with, but got a bit better as the night went on. On Saturday again I played some more Destiny. In the evening between 10pm and midnight, you were given access to another mission, this time it was on the moon. So as soon as 10 rolled around I got straight on that. The moon looked really good, and the mission was pretty fun, with a nice intense battle at the end with a big ol’ moon wizard. Now the Beta is over (sad face), I thought I would reflect on it a little bit. Firstly the story, the missions were pretty easy, and seeing as the game leans towards co-op I thought they might be a little harder on your own, but I got through them all pretty easily, and without much trouble. And as for the actual story line, it’s ok. Nothing ground breaking as of yet. It’s your typical “You must save humanity.” “You’re Earths last hope.” Yadda yadda. I didn’t not like it, I just didn’t feel all that engaged with it, having said that, there were only 5 missions to play. Exploration is another area that has been hyped up quite a lot, with random missions, random encounters with other players, and random public events. The random missions again are pretty simple. Mostly they were just “kill x number of people.” Or “collect x amount of x.” Pretty basic stuff. I did enjoy bumping in to people whilst playing, as it would usually result in an impromptu dance session. But communication is still lacking, not being able to actually talk to someone unless you join a fire team with them isn’t very helpful. A DayZ style comms system would work well I think, whereby it works using proximity, so if you are close to someone you can hear them talk. Now the public events. I only encountered two whilst playing, which was a shame. The first one was defending the Warsat, which we passed. The second one was to take out a super tough Captain before he ran away, this one we failed. Even though I only found two, I still really liked them. Seeing all the players converge on one area, to fight together in a Guild Wars 2 style was pretty cool. And the resulting dance party when you completed it was also fun. I’m really looking forward to seeing more of these in the full release. The PVP side of things or the Crucible to give it its proper name was just what you would expect from a Bungie multiplayer shooter. Controls were tight, maps were good, and for a Beta it was all pretty well balanced. I wasn’t very good in the Crucible however. I did take me a long while to get used to it. But I can see myself playing it quite a lot from September 9th. Overall I really enjoyed the Beta, and it has made me more excited for the full game. I am however a little worried about the piece of news that floated around at Comic Con, and the fact that Old Russia as it was in the Beta, is as big as it will be in the full game. I hope that’s not true. Roll on 9th September! Days off work are booked! But what to do until then? I think I might try out Divinty Original Sin, as I’ve heard many good things. Well week one of my time off was a bit of an anti climax given I had builders in from 8am to 4:30pm Tuesday, Wednesday and Thursday resulting in electric off and no gaming. However once they’d gone and the dust settled I did rinse Destiny Beta a fair amount. Saturday more work on the house, this time having electric work done meant deffo no electric, so another day of no gaming. That evening I had a drink with the guy who did the work on the house, and then when back home and watched some Sopranos. Sunday was a pretty dececnt day for Geeking. I played alot more of Destiny again getting my last minute fix in. Then had a Dexter marathon and got through 5 episodes of season 1. I just fancied watching this again, so I’m now juggling Sopranos and Dexter. Another bit of news was the Destiny news, in that each planet had only 1 explorable area. If this is in fact true, it’ll be pretty dissapointing. I tried to find official confirmation on how many planets there will be as this was also up in the air with some saying only 4 planets and other saying 7. I couldn’t get official numbers, but hopefully Bungie will address this news shortly as given how good the Beta was, it’ll be terrible if it is only one area per planet to explore. Oh well week 2 off work begins, and it’s pay day today, so I’ll hopefully be adding The Last of us remastered to my PS4 collection at the end of the week. ← 3 New Monsters for Godzilla Sequel? Seems each “area” in the explorable map had its own unique world event with a degree of difficulty relative to the mobs within the zone. While you’re bang on that the impromptu get together created some instant camaraderie, too often I found myself alone when the darkness flashed the screen and didn’t have a hope in hell of completing it (like the Moon!). As to the number of planets, I saw a post on the Destiny Beta reddit where a “dev” outlined that the Beta was at best 10% of what we should expect. Assuming a portion of that percentage is lined up in the Crucible, then that leaves us about 7/8 planets to go – but then that’s as dirty of a mathematical hypothesis you’ll ever find. I’ve also heard about the 7/8 planets thing, the only ‘worrying’ bit I though was that it sounded like old Russia wasn’t going to be bigger than the beta version. Only more missions in it. Either way I’m still really excited for the full game. It’s been confirmed that Earth, Mars, Venus, and the Moon are the only playable areas at launch. It is disappointing, but I expect Bungie to release content regularly.